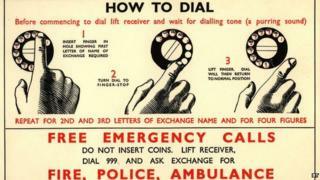 When the 999 service was launched in London 75 years ago it was the world's first emergency phone number. What happened when it rang for the first time? On 30 June 1937, the capital's new emergency telephone line was unveiled. A notice in the Evening News advised the public how to use it. "Only dial 999... if the matter is urgent; if, for instance, the man in the flat next to yours is murdering his wife or you have seen a heavily masked cat burglar peering round the stack pipe of the local bank building. "If the matter is less urgent, if you have merely lost little Towser or a lorry has come to rest in your front garden, just call up the local police." John Stanley Beard was woken in the early hours of the morning by a noise underneath his bedroom window in the affluent neighbourhood of Hampstead, north London. The architect told Marylebone Police Court that he looked out and saw a man's foot. He shouted at the man who, on hearing Mr Beard's voice, ran off down the garden path, jumped over some railings and headed towards Primrose Hill. Meanwhile, Mr Beard's wife - referred to in reports only as Mrs Beard - dialled 999. In less than five minutes, 24-year-old labourer Thomas Duffy had been arrested. He was later charged with an attempted break-in with intent to steal. In a public relations coup for the new service, the Times reported that Mr Beard told the court that he was pleased to see that his tax money was being put to good use. "My wife made use of the new signal which we were instructed to use yesterday on the telephone, and as a result of using that signal almost instantaneous connection was made with the police station, and in less than five minutes this man was arrested," he said. "It struck me, as a householder and fairly large taxpayer, that we are getting something for our money, and I was very much impressed by it." Not all the calls made to 999 in its first week were as serious as Mrs Beard's. In fact, of the 1,336 calls made, 91 were prank calls. Quicker access to the fire brigade was the reason the idea of an emergency number had been debated initially . The public's willingness to call on the police couldn't be more different from their attitude when the force was formed. "There was a lot of opposition to policing in London when it was formed in 1829. Some people objected to it on cost. Some people saw it as a military force being imposed on London and a great effort was made to try and make them blend in with the public," says Neil Paterson, the manager of the Metropolitan Police Heritage Centre. "Ironically, at the turn of the century, the police resisted having telephones put in the station. They thought it would be embarrassing for members of the public calling in. "As soon as 999 was introduced, the success of it showed immediately and it spread out to the whole country and it resulted in arrests and people getting assistance quickly." The service was introduced in Glasgow a year later, in 1938. But it wasn't until after World War II that it spread to other parts of the UK, including Belfast, Birmingham, Bristol, Edinburgh, Liverpool, Manchester and Newcastle. It became available to the entire country only when all the telephone exchanges were automated in 1976. Dr Chris Williams of the Open University says the introduction of police radios had been the key to the service working, because it allowed real-time communication that then enabled quick responses to emergency calls. Despite a positive start, there were still some teething problems. Like today, operators would answer the calls and then transfer them to the appropriate emergency service. Now it is BT and Cable & Wireless who answer the calls. Back in 1937 when the Post Office ran the telephone network, operators were alerted to an incoming 999 call by a flashing red light and a klaxon. A 1951 article in the Post Office Telecommunications Journal described fairly chaotic scenes in its call centres during 999's early days. "When the raucous buzzer sounded in the quiet disciplined switchrooms a few of the girls found the situation too much for them and had to be carried out. It was even suggested in the press that the buzzers were disturbing other people living in the vicinity of the exchanges!" Thankfully for the call handlers, technology has led to efficiencies in dealing with a huge growth in calls over the years. Mobile phone technology in particular led to a dramatic spike in the number of calls made. When the 999 service was first made available to mobile phones users in 1986, fewer than 19 million emergency calls came into BT annually. Last year, BT handled 31 million calls, while a further six million were handled by Cable & Wireless. Half of those, though, weren't put through to the emergency services because 999 had been unintentionally dialled from people's mobile phones or they were prank calls. Of the calls that were put through, more than half asked for police assistance. The next most requested was the ambulance service, followed by the fire brigade and, finally, the coast guard. It's a pattern that has been consistent since the number was introduced. Met Police historian Mr Paterson says the sheer volume of 999 calls represents the biggest change since he started out as a police officer in the 1970s. "When I joined the police, most people didn't have phones - they were relying on phone boxes," he says. "Now most people have mobile phones, so one incident today would generate dozens of calls, whereas before it was just one or two calls. "Of course all of those calls have to be answered quickly. And the pace of life has got much faster - people expect an instant response."